Upon invitation, Vice Premier Zhang Gaoli of the State Council will attend the opening ceremony of the Boao Forum for Asia Annual Conference 2017 in Boao, Hainan and deliver a keynote speech on March 25. President of Madagascar Hery Rajaonarimampianina, President of the Federated States of Micronesia Peter Christian, Prime Minister of Nepal Prachanda, Speaker of Wolesi Jirga of the National Assembly of Afghanistan Fazel Hadi Muslimyar, and Vice President of Myanmar Myint Swe will attend the annual conference upon invitation. At the invitation of the government of Federal Democratic Republic of Ethiopia and the government of the Republic of Guinea, State Council Yang Jiechi will visit Ethiopia and Guinea from March 20 to 22. Q: Adopting Resolution 2344 on Afghanistan on March 17, the UN Security Council encourages the international community to further assist Afghanistan and enhance regional economic cooperation through the Belt and Road Initiative. This marks the first time for the Security Council to incorporate the important concept of building a community of shared future for mankind in its resolutions. What is your comment? A: In Resolution 2344 unanimously adopted by the UN Security Council, the important concept of building a community of shared future for mankind was incorporated for the first time, reflecting the consensus of the international community. The resolution urged all parties to further advance the Belt and Road Initiative and raised specific requirements on strengthening security safeguards. This carries forward and develops on the previous statements made on the Belt and Road Initiative made by the UN and the Security Council. China would like to work with UN members to actively move forward the building of the Belt and Road Initiative following the Security Council resolution and jointly build a community of shared future for mankind that enjoys lasting peace, universal security, common prosperity, openness and inclusiveness, cleanness and beauty. Q: US officials say that the Trump administration is preparing a large sale of new weapons to Taiwan. Has China lodged representations with the US over this? A: China’s position in opposing the arms sale is consistent and clear. We hope that the US can fully recognize the high sensitivity and severe harmfulness of such arms sale, remain committed to the one China policy and the principles of the three China-US joint communique, stop selling arms to Taiwan, properly handle the Taiwan question with prudence, and preserve China-US relations and peace and stability across the Taiwan Straits. Q: US Secretary of State Tillerson ended his visit to China yesterday. Are we any closer to any details regarding a meeting between President Xi Jinping and President Trump? Could you give any details of that? A: Both China and the US place high importance on exchanges at all levels, including between the leaders. During Secretary of State Tillerson’s stay in Beijing, the two sides had thorough discussions on arranging a meeting in the near future between the two leaders. Relevant preparatory work has been kick-started. The two sides agreed to remain in close communications on this to ensure that the leaders’ meeting and exchanges at various levels are successful and fruitful. We will keep you updated. Q: The ROK said that it had complained with the WTO about China’s retaliation against the ROK over the THAAD deployment. What is your comment on that? Are the difficulties these ROK companies are experiencing purely a result of restrictive measures China has enforced? Will you stop enforcing these measures if the THAAD system is withdrawn? A: We have repeatedly stated our position on the relevant issue. We support normal business and trade exchanges between China and the ROK, but this needs a corresponding basis in public opinion. In the meantime, China’s position on opposing THAAD is consistent and clear. Q: As determined in the relevant resolution adopted by the General Assembly last year, the United Nations will convene negotiations in New York on March 27 on a legally binding instrument to prohibit nuclear weapons. China abstained from the vote on it last year. Now that a new round of negotiations is approaching, has China decided to participate in it or not? A: China consistently upholds and actively advocates a final comprehensive ban on and total destruction of nuclear weapons, which is fundamentally in line with the purposes of negotiations on the nuclear weapon ban treaty. China also believes that realizing disarmament, which cannot be achieved overnight, must be pressed ahead in a gradual and incremental way following the principle of safeguarding global strategic stability and compromising the security of no country. Relevant process must be advanced within the existing international disarmament and non-proliferation regime. China has been engaging in candid and though communications with relevant parties on issues concerning the treaty negotiations. After careful considerations, China has decided not to participate in the new round of negotiations. This is a choice made to maintain the current international arms control and disarmament regime and move ahead nuclear disarmament in a gradual and incremental way. It demonstrates China’s responsible attitude towards maintaining global strategic balance and stability. Therefore, whether we show up at the negotiating table or not, there is no change to China’s position on supporting a final comprehensive ban on and total destruction of nuclear weapons. 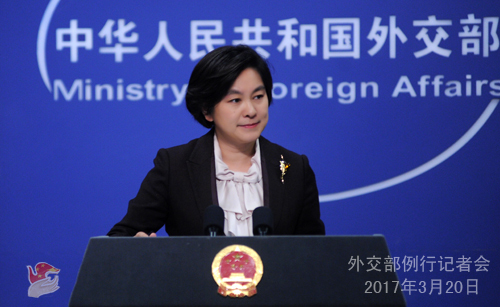 China would like to remain in touch with relevant parties and make joint efforts for the realization of a nuclear-free world. Q: According to Indian reports, the Indian Culture Ministry and the New Nalanda University hosted the international Buddhist conference held at Rajgir in the state of Bihar from March 17 to 19. The 14th Dalai Lama and Indian Culture Minister Mahesh Sharma inaugurated the conference together. Dalai also addressed the conference. What is your comment? A: Recently, India ignored China’s solemn representations and strong opposition and insisted on inviting the 14th Dalai Lama to attend an international Buddhist conference organized by the Indian government. The Dalai Lama also shared the stage with Indian government officials and gave a speech. China is strongly dissatisfied and resolutely opposed to this. We urge the India side to clearly recognize the anti-China separatist nature of the Dalai clique, abide by its promises on the Tibet-related issues, respect China’s core interests and avoid further disturbances and harm to China-India relations. Q: At the China Development Forum this morning, Foreign Minister Wang Yi said that any chance of dialogue on the Korean Peninsula must be seized. Was he referring to a particular chance he sees at the moment? Or was he speaking in general terms? A: Recently China has been reiterating its stances on the Peninsula situation and explaining its proposal on resolving the Korean nuclear issue. When meeting the press with Secretary of State Tillerson, Foreign Minister Wang Yi also went into details on China’s role in the Korean nuclear issue. In retrospect of how the Korean nuclear issue has evolved to the current stage, we can learn experiences from the successes and lessons from the setbacks. The most important success is the September 19 Joint Statement reached in 2005 which charted a roadmap for the DPRK to abandon nuclear and missile developments and realize denuclearization. The most important experience is to address the legitimate concerns of all parties in an equal measure. At the current stage, the Peninsula situation has reached another fork in the road. Choice has to be made between ratcheting up tension towards possible conflicts and following Security Council resolutions to find a breakthrough in resuming talks and returning to the negotiating table. Our advice is a “dual-track approach” to promote denuclearization of the Peninsula and establish a peace regime in parallel and a “suspension for suspension” when the DPRK suspends all its nuclear and missile activities and the US and the ROK suspend large-scale military exercises, with the latter laying the groundwork for the former. We hope relevant parties can give due considerations to China’s“dual-track approach” and “suspension for suspension” proposal which is practical, feasible, reasonable, objective and unbiased. We hope all parties can be level-headed when judging the current situation, make their choices wisely, and discover opportunities amid challenges. Q: Joseph Yun, special representative for DPRK policy of the US State Department is in Beijing to exchange views on the Korean nuclear issue. Can you tell us more about the meetings? A: Today, Special Envoy Wu Dawei of the Chinese government on the Korean Peninsula affairs met with his counterpart Joseph Yun. They had candid and in-depth exchange of views on easing tension on the Korean Peninsula, maintain peace and stability on the Peninsula, and moving forward the denuclearization of the Peninsula. Q: Last Friday, you said that the X-band radar of THAAD covers an area of over 2,000 km. There are all sorts of claims regarding the radius of the THAAD system. So where did you get this specific date? Is it a result of China’s independent analysis or cooperation with the US side? A: We have noted that some people in the ROK said that the THAAD deployment is solely for the security of the ROK, and China has no reason to object. As a response, I said last Friday that the X-band radar of THAAD covers an area of over 2,000km. It is common military knowledge. Far exceeding the normal defense needs in terminal interception, the X-ban radar extends its monitoring and early-warning radius beyond the Peninsula and even covers the hinterland of the Asian continent, including great swathes of Chinese territories, which is unnecessary for the ROK to deal with external nuclear and missile threat. We understand the ROK’s concerns over its security, but it shall not try to preserve its own security at the expense of China’s security interests. Q: According to the KCNA report on March 19, the DPRK tested new high-thrust rocket engine on March 18, suggesting that it may be used to launch long-range missiles. What is your comment? A: China has noted relevant reports. The Security Council has made clear rulings in its resolutions on the DPRK’s launching activities using ballistic missile technology. We hope that the DPRK faithfully observes relevant resolutions. 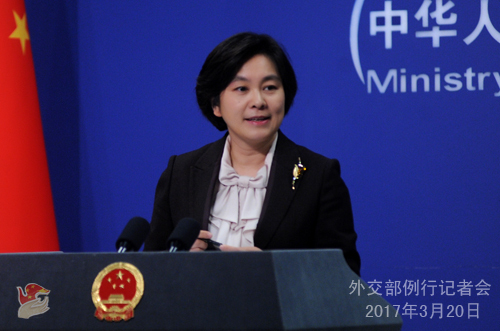 China believes that considering the current circumstances, relevant parties should exercise restraint, refrain from provoking each other, and avoid escalating tensions on the Peninsula. Q: After Secretary of State Tillerson’s visit, have you got in touch with the DPRK to propose any new ideas and encourage them to change course? A: we are in close contact with all relevant parties of the Six-Party Talk to clearly articulate China’s position. We have tabled our solution to rescue the Peninsula out of the current security predicament, which is the “dual-track approach” and “suspension for suspension”. We believe that all relevant parties are clear of that. Q: Regarding the weekend test of the high-thrust rocket engine, has China made any representations with the DPRK? A: As I just said, we are in close contact with all relevant parties of the Six-Party Talk, including the DPRK. We have stated our position on carrying launching activities using ballistic missile technology. Considering the current situation, we hope that all parties can remain calm, exercise restraint, bear in mind the long-term peace and stability of the Peninsula and Northeast Asia, and practice caution. Q: The timing of that test stands further reading. Do you have anything to say in terms of its provocative nature or the timing of the test? A: As for the choice of the timing, I cannot make any comment. You need to ask them for their consideration behind the timing. Our position is consistent that the DPRK should respect the relevant resolutions of the UN Security Council. Q: It is reported that Premier Li Keqiang is going to see the Sydney Swans play football while visiting Sydney. Can you confirm? A: Australian Prime Minister Turnbull attaches high importance to Premier Li Keqiang’s upcoming visit to Australia, and has put great thoughts into the schedules of Premier Li Keqiang. The two sides are in close contact on this. As for this football trip you are especially interested to know, I suggest we wait in patience. Premier Li Keqiang’ visit will be very exciting and successful. We announced last Friday that Premier Li Keqiang will pay official visits to Australia where he will host the fifth China-Australia Annual Prime Ministerial Meeting and New Zealand from March 22 to 29. 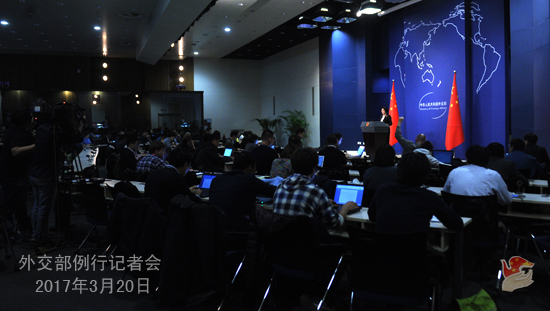 The Foreign Ministry will hold a press briefing in the Blue Room at 10 a.m. on March 21 (Tuesday). Vice Foreign Minister Zheng Zeguang will brief the press on Premier Li Keqiang’s visits to Australia and New Zealand, and take questions from the media. You are welcome to sign up for attendance.